What we understand by DevOps, its impact on the culture of the company and which tools are used to practice DevOps methods. In recent years, DevOps has taken the IT world by storm and substantially changed software development. It affects how companies develop, deploy and monitor software and operate applications as well as the underlying infrastructure. But what exactly is DevOps? Historically, developers (Dev) and the IT operations (Ops) have worked in separate teams. But the shrinking release cycles make this kind of approach no longer practical. With a modern DevOps approach,responsibilities for the operation are shared and moved further up into the development process. 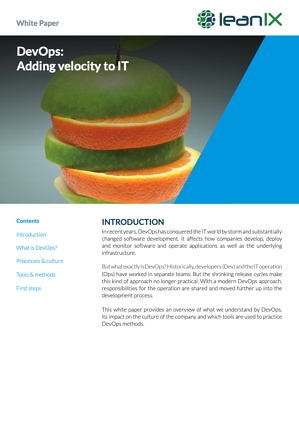 This white paper provides an overview of what we understand by DevOps, its impact on the culture of the company and which tools are used to practice DevOps methods.